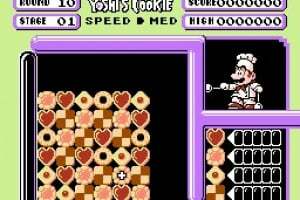 Mario and Yoshi are filling in at the cookie factory, and they need your help! As freshly baked cookies roll out of the ovens, you must sort and stack them before they pile too high. In this fast-paced puzzle classic, line up rows of matching cookies horizontally or vertically to make them vanish. 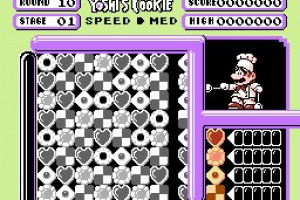 Clear the screen and you’ll move on to a new level of cookie chaos. Play for a high score or go head-to-head against a friend in the frantic two-player mode. And if you lose, don’t worry; that’s the way the cookie crumbles! i love this game...it's sooo addicting! Looks great in the gameplay video. Looks good, but I'd rather have Tetris Attack. would rather have had the more colourful SNES game. I want to have this game, I used to play it endlessly with my sister... so many memories of this game! I used to have this game. Was pretty fun. I dunno if I'd want the SNES version, myself. Lacks the Mario in a chef hat. I guess it would depend on what the cutscenes mentioned are like. 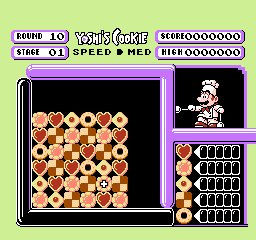 As far as a puzzle mode goes, the NES version's main mode at least is similar, in that you could potentially win a round in very little time if you make the right moves (as shown in the video). In any case, I might easily re-obtain it if it hit the VC here in the US. I remember the tv ad for this game. It was odd, if I recall right. 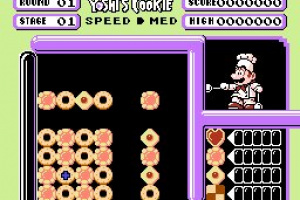 Mario is a chef and he has cookies coming fresh out of the oven in random bunches. 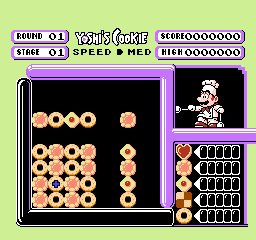 Your job is to line up the cookies so that all of the same type are on a row or columb, and then they clear out and Yoshi gets a tasteful treat!!! 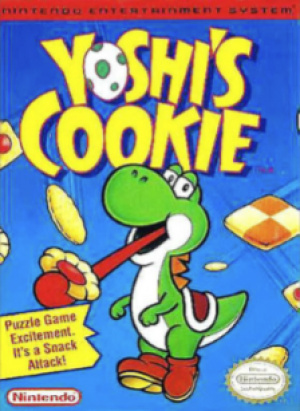 Don't listen to the review - Yoshi's Cookie is a 5-star title in my book - In contrast Mario & Yoshi (a true three star game in my book), which many have probably already downloaded, flails in comparison to this classic gem, and even though the graphics are all NES, the cookies still look so yummy that it makes my tummy rumble just thinking about it. A MUCH better game compared to Yoshi, er, umm, "Yoshi's Omlette"
Come on peoples - at the very least you could have given a 4-star rating, D'oh! I think I'll hold out for the SNES version. Of course, seeing as we have yet to get the SNES version of Wario's Woods on the VC, who knows when we'll get this? Really nice game, although a bit short. Like, c'mon, only 100 levels; I accomplished them in three hours in medium difficulty on the first night I got this game. Why are there coming such crappy games on the VC, just give us the games people REALLY want! 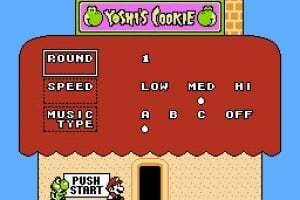 What was the name of the puzzler on the SNES starring Yoshi, that was a follow up to the NES title Yoshi? They also used the same puzzle format for the game Pokemon Puzzle League on the N64. I think you're thinking of Tetris Attack. I'd have to agree, this isn't really a great puzzler. I do enjoy it, though, it's certainly unique and worth $5 for a puzzle fan. Coookieeeee...... Ha, I would always remember that commercial. This game is addicting, and always fun by playing with other people. This game is definitely worth the 5 U.S dollars. I'd get it if they had the SNES Version. You basically try to form full rows and columns. Each clear earns a point, earn enough points and win the round. 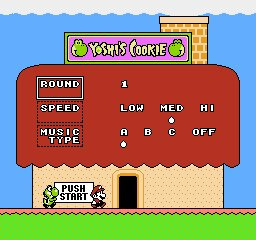 Every normal clear makes a single Yoshi Cookie appear. 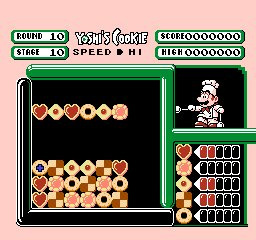 A combo will make a five Yoshi Cookies appear, which is enough to easily make a clear with them. The attack that will occur cycles (i.e. Slave "OPP", Panic "YOU", +7 "YOU", -3 "OPP", etc. 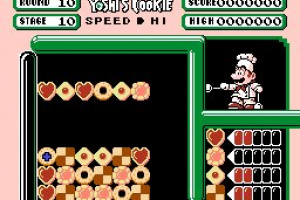 ), and when you clear Yoshi Cookies, the attack will be performed. They affect a particular player (so be careful not to help your opponent or harm yourself). I used to hate the game when I first played it. It's actually pretty damn good. 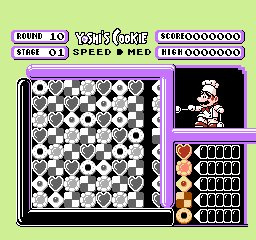 Unlike most Nintendo puzzlers, the character you choose actually makes a difference (whereas in Tetris Attack and Pokemon Puzzle, it's merely aesthetic, and in SNES Wario's Woods, the computer taunts you with a whole slew of unplayable character sprites). Bowser has to play faster because of his short fuse, but his attacks lasts for what seems like an eternity. Mario is balanced. Yoshi has good defense, and Peach's attack cycles quicker. Obviously, it's not Tetris Attack (but then, you might as well be comparing Mighty Final Fight to Guardian Heroes), but it's great and unique. 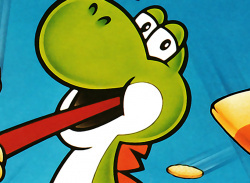 Every puzzle game under Nintendo's belt, save for maybe Yoshi, has been exceptional. One understandably neglected puzzler is the Satellaview classic Wrecking Crew '98. I freaking love that game, and I always pick the Onigiri (riceball). I'm tired of playing it on emulators, and Nintendo has completely missed the 10 year anniversary of the game for a rerelease. Did thid come out after Yoshi?